For other uses, see Braithwaite (disambiguation). 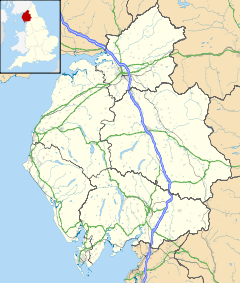 Braithwaite /ˈbrɛθɪt/ is a village in the northern Lake District, in Cumbria, England. Historically in Cumberland, it lies just to the west of Keswick and to the east of the Grisedale Pike ridge, in the Borough of Allerdale. It forms part of the civil parish of Above Derwent. Braithwaite has a Village Shop by the Low Bridge, several pubs, including the Coledale Inn, the Royal Oak and the Middle Ruddings Hotel. Braithwaite is easily accessible due to its close proximity to the A66. It has a campsite with a caravan park, B + Bs, pubs and guest houses. It has a wide range of sports including sailing, climbing, abseiling, canoeing, hang-gliding, parasailing, orienteering, bird watching (For ospreys in the nearby lakes), photography and virtually any other outdoor pursuit all within four miles of the village. This page was last edited on 21 March 2019, at 13:51 (UTC).